Hello You Books: [ 63/365 ] ..... Matthew V.
[ 63/365 ] ..... Matthew V.
One of my cousin’s on my dad’s side. We hadn’t had a baby in the family for a long time so he was spoiled a lot. Now he’s about to graduate from Purdue, but I won’t hold it against him. ... a WAHM who can grade papers and sing Down By the Bay at the same time. Slightly weathered. Confident, yet a tiny bit reluctant. Wife. Mother. Daughter. Sister. Friend to many. Loving. Patient. Known to be a bit emotional at times. Talkative. Perfectionist to a fault, but working on it. Creative. Flexible. Fluffier than she'd like. Loyal. Faithful. Child of God. Blessed... oh so blessed. Super busy? Looking for that perfect gift? 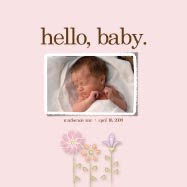 We provide busy people like you with custom designed photo books and photo board books for babies & toddlers. We help you share life’s joys! Deep down you know you want to capture life’s moments and preserve them for your kiddos. Yet who has the time (or even know where to start!) to create the photo-based products you see online. Now with Hello You Books you have the opportunity to tell those stories through photo books and photo board books for your little ones. Simply click on the categories below to see how to get started. [ 78/365 ] ..... Chantelle S.
[ 77/365 ] ..... Julie T.
[ 78/365 ] ..... Leslie L.
[ 75/365 ] ..... Mark R.
[ 73/365 ] ..... Addison R.
[ 71/365 ] ..... Mrs. N.
[ 70/365 ] ..... Colleen M.
[ 68/365 ] ..... Mrs. M.
[ 69/365 ] ..... Margaret L.
Finalist in Photography Challenge - Click & Vote! [ 67/365 ] ..... Christine K.
[ 66/365 ] ..... Lauri B. [ 64/365 ] ..... Matt D.
[ 62/365 ] ..... Christopher S.
[ 61/365 ] ..... Karen W.
[ 60/365 ] ..... Jim R.
[ 503 April Photo Challenge ] My light. My hope. [ 59/365 ] ..... Myrna H.
[ 58/365 ] ..... Bill L.
[ 57/365 ] ..... Kaaren F.
[ 55/365 ] ..... Lisa B. [ 54/365 ] ..... Barbara U. [ 53/365 ] ..... Dawn A. [ 52/365 ] ..... Tim K.
[ 51/365 ] ..... Jane W.
[ 49/365 ] ..... Tina R.
[ 48/365 ] ..... Claire W.